LABOR VS. MANAGEMENT | Carol Sheldon writes books exploring times-past through mystery, love, betrayal and murder. ← DRIVEN TO RAGE IS AVAILABLE! Tonight’s the night—my first book reading for DRIVEN TO RAGE. If you’ve been following my blog, you know the event is tonight, Monday 6:00 in Book Passage at the Ferry Building in San Francisco. I’m really looking forward to it. And it’s a party with refreshments! THE ISSUE OF MANAGEMENT VS. LABOR IS AN OLD ONE. Certainly for centuries, there was no question that Labor had no voice. It was only in the mid-1800s that such a thing began to be heard of. In the early 1900s, managers of lucrative companies wouldn’t hear of organized labor. But still poor wages, long hours and dangerous working conditions led to the formation of unions among miners, brewery and mill workers. This is the background of DRIVEN TO RAGE. The issue still rises today. It is an old conflict, not likely to disappear in the near future. One of my editors faces a strike in her work place as I write this. But against the background of this strike DRIVEN TO RAGE follows a family torn apart by taking opposing sides. Soon I will put up the first chapter of my book for you to read on this blog. Stay tuned. 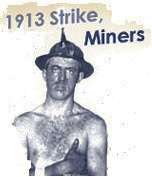 This entry was posted in Historical Fiction, miners' strike and tagged Labor vs Management. Bookmark the permalink.